You can assign a student group leader to help manage a group within your course. You can assign group leaders automatically or manually. When students are assigned to be a group leader, they can manage members of the group and edit the group name. However, they cannot change the number of members allowed in the group. Students do not receive any notification that they have been added as a group leader, but they can access groups directly from the Groups link in Global Navigation or through the People page in the course. Note: If an assigned group leader drops out of the course, you will have to select a new group leader only if the group leader was assigned manually. 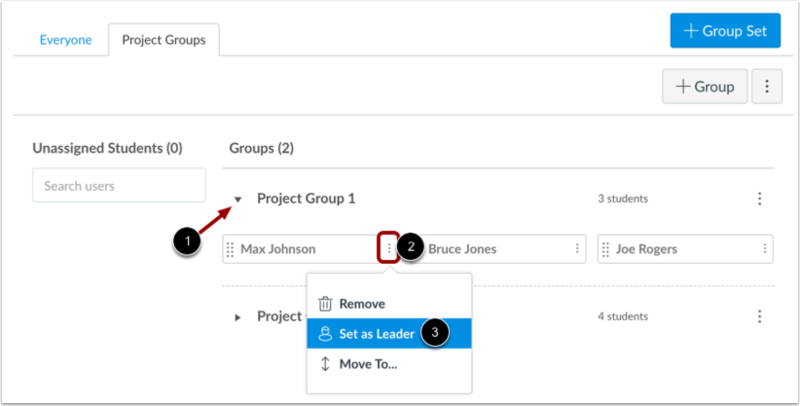 If you automatically assigned a group leader as part of creating a group set, Canvas will automatically assign another leader to the group. You can add a group leader as part of a group set. To create a new group set, click the Add Group Set button . Note: You can also edit existing group sets . Note: If you want to create groups manually, you also have to set a student leader manually. Set first student to join as group leader. 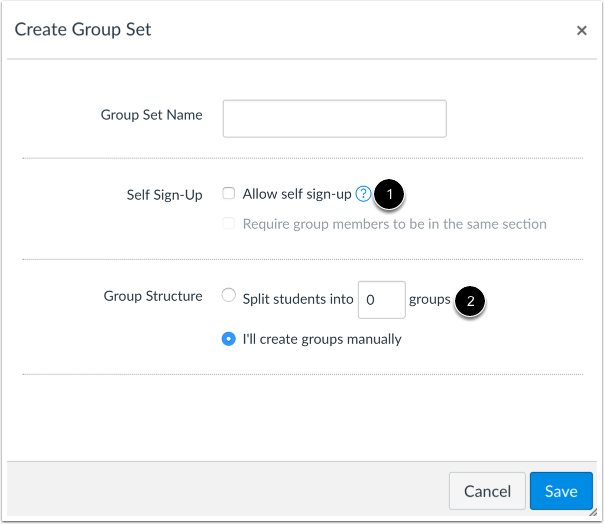 This option tells Canvas to assign the first student who joins the group as the group leader. Set a random student as group leader. This option tells Canvas to choose a student randomly. Note: If you choose to have Canvas split your students into an equal number of groups automatically, you can select either radio button for the leadership option. If you select the first radio button, the first student who joins each group as part of the automatic group distribution process will be the group leader. To add a leader in an individual group, click the name of a group set. Expand the group where you want to add a group leader . Locate the student name and click the user Options icon . Select the Set as Leader link . View the student name next to the name of the group , which indicates the student is the leader for that group. 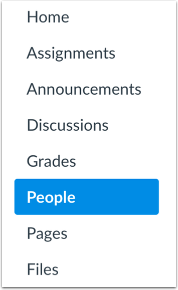 When viewing the list of group members, you can also quickly identify the group leader as the student name will display a People icon . You can manually remove a group leader at any time. To remove a student group leader, expand the group to view all students . Locate the student group leader and click the user Options menu . Then select the Remove as Leader link . Previous Topic:How do I manually assign students to groups? Next Topic:How do I message students who have not signed up for a self sign-up group? Table of Contents > Groups > How do I assign a student leader to a group?